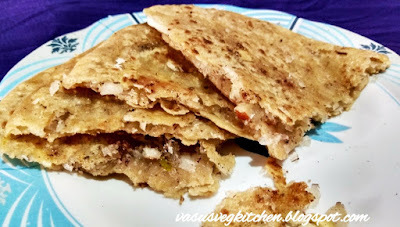 Sweet Coconut paratha is easy sweet recipe prepared with sweet & fresh coconut stuffing. 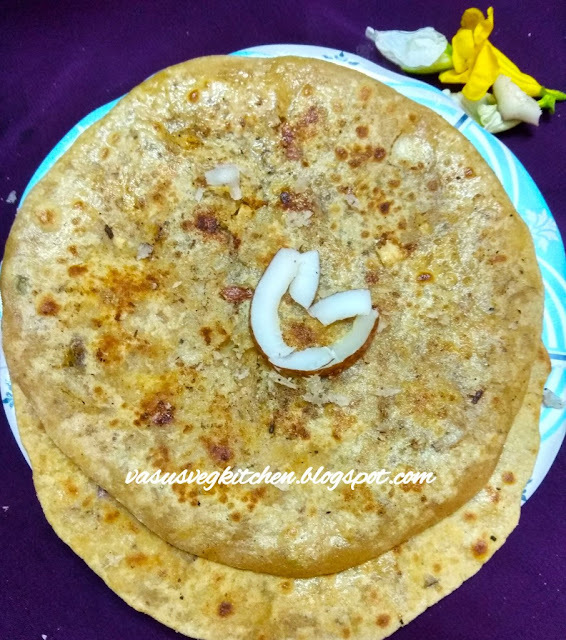 My mom use to prepare sakkari Chapathi in kannada, sugar chapathi whenever she prepare chapathi 😋.We can prepare this sweet coconut paratha in two variations, check it out. 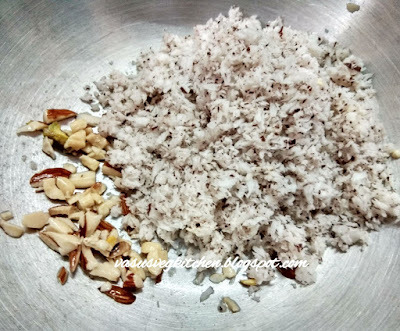 This is kids friendly sweet recipe for tiffin box. You can also serve it as dessert or as snack with a cup of tea. It is easy to prepare when sudden guest visits home. 1) Take a mixing bowl add wheat flour, pinch of salt mix it well by adding little amount of water knead it and make a dough. 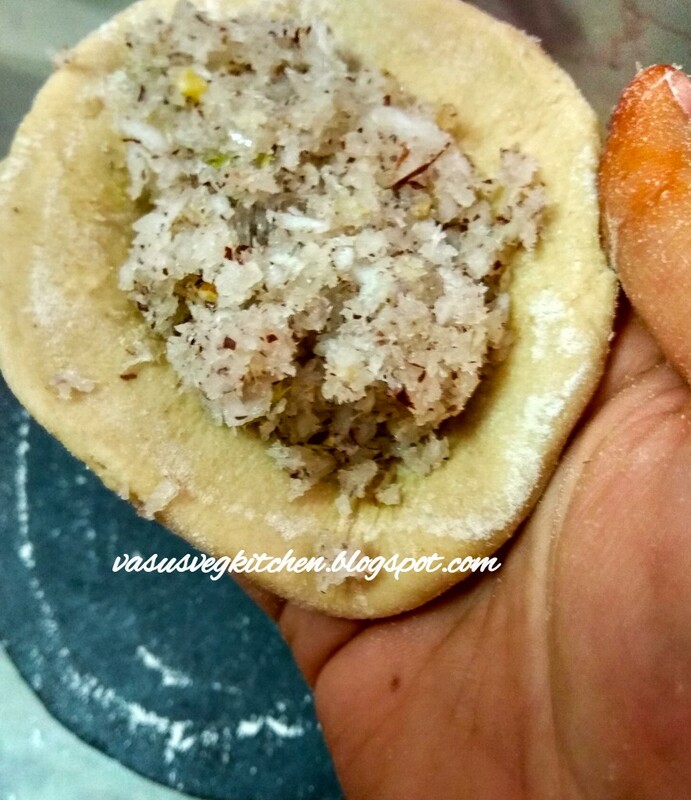 Close the dough with lid or moist cloth and keep it aside for 20 min. 2) Meanwhile we will prepare fore stuffing. 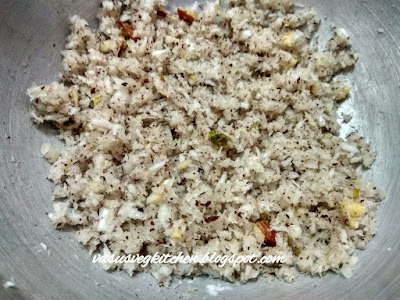 Take a pan add 1/2 tsp ghee, add grated dry fruits and fresh grated coconut fry it till coconut changes golden brown color on low flames and switch off the flames. 3) Now add sugar powder and elachi powder. I added elachi in sugar and powdered it. 4) Mix the above well. 5) Now knead dough well, pinch some dough and make small lemon sized ball. 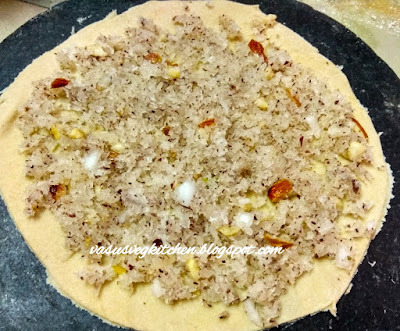 Dust some wheat flour and roll it into small chapathi using rolling pin. 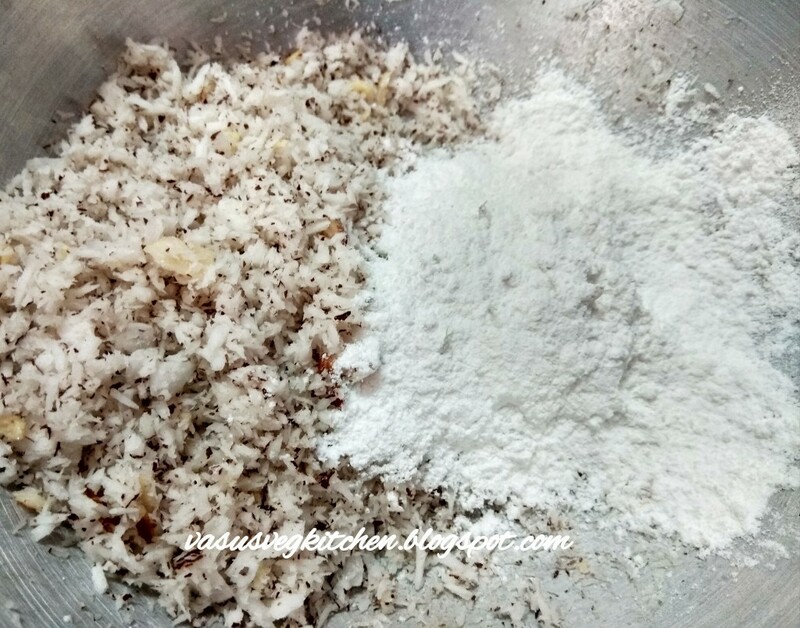 6) Take some above prepared coconut mixture in the middle of dough. 7) Fold it from corners and give it chapathi shape. 8) You can use rolling pin or you can use your fingers to give it round shape as shown below. 9) Take tawa heat it and grease 1/2 tsp ghee on tawa. 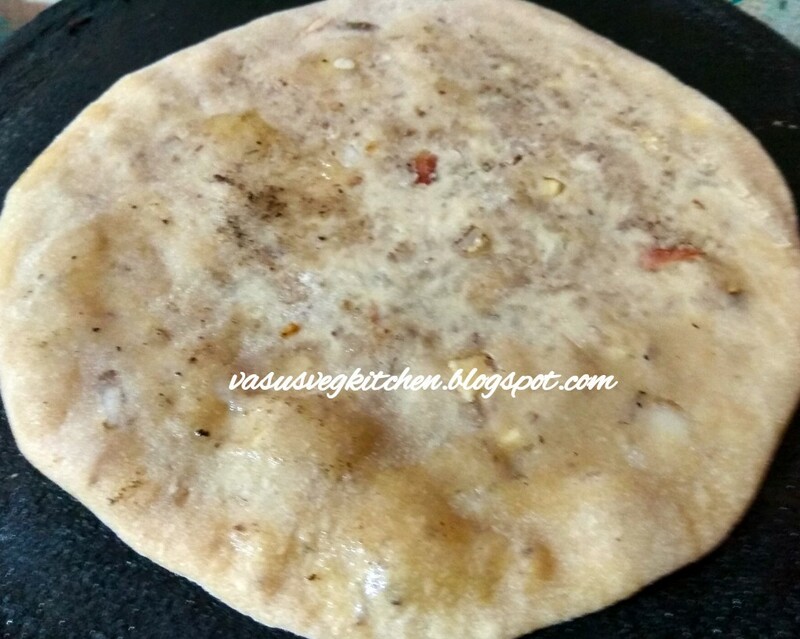 Place above paratha and let it roast it beneath, grease 1/2 tsp of ghee on the paratha. 10) Turn the paratha to other side and heat it till you get brown golden spots on both sides as shown below. That's it paratha is ready. 11) Pinch some dough, dust some wheat flour and roll it to round chapathi. Prepare 2 chapathi's. Dust some flour, take one chapathi and spread prepared coconut mixture on the chapathi as shown below. 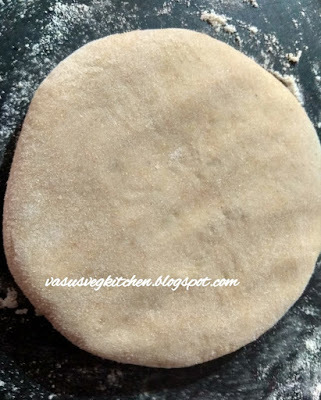 12) Grease the corner with oil or water and place another chapathi on the above and press the cross with your finger. (pic missing). 13) Fry the above as explained in variation - I.
Yummy and Tasty sweet coconut paratha is ready to serve 😋😋. 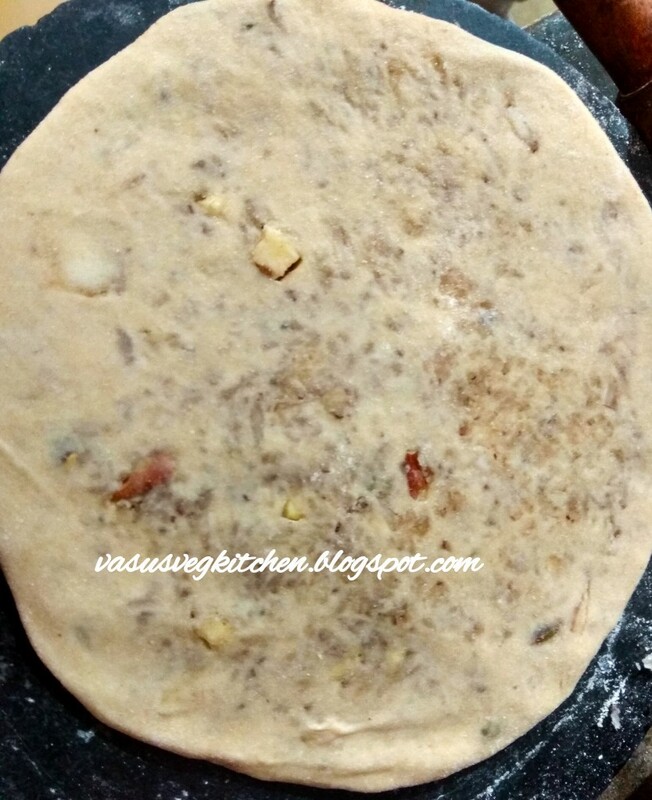 ◆ You can prepare parathas in any variation as per your comfort. 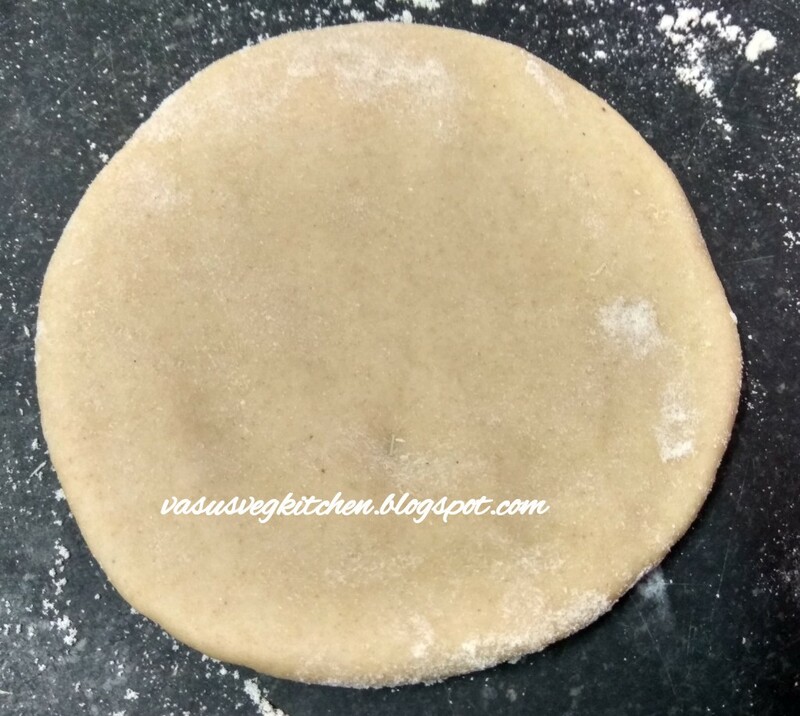 ◆ In variation-I instead of using rolling pin (step - 8) you can prepare it with your fingers. 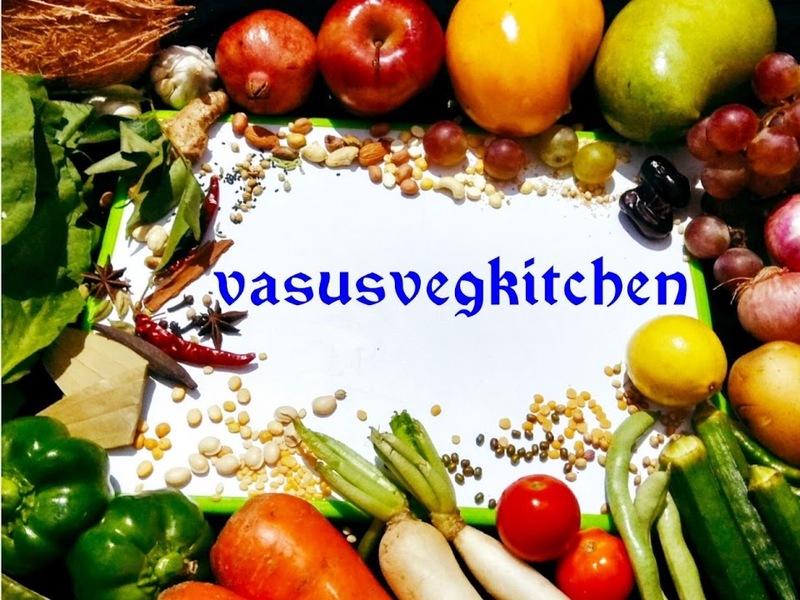 ◆ Adding dry fruits is optional. 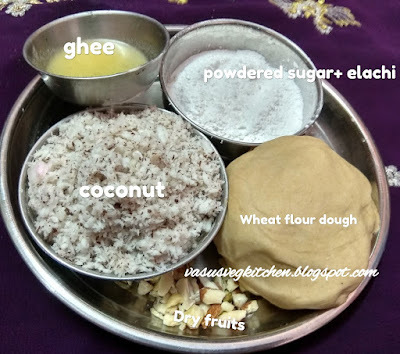 ● You can use jaggery instead of sugar. 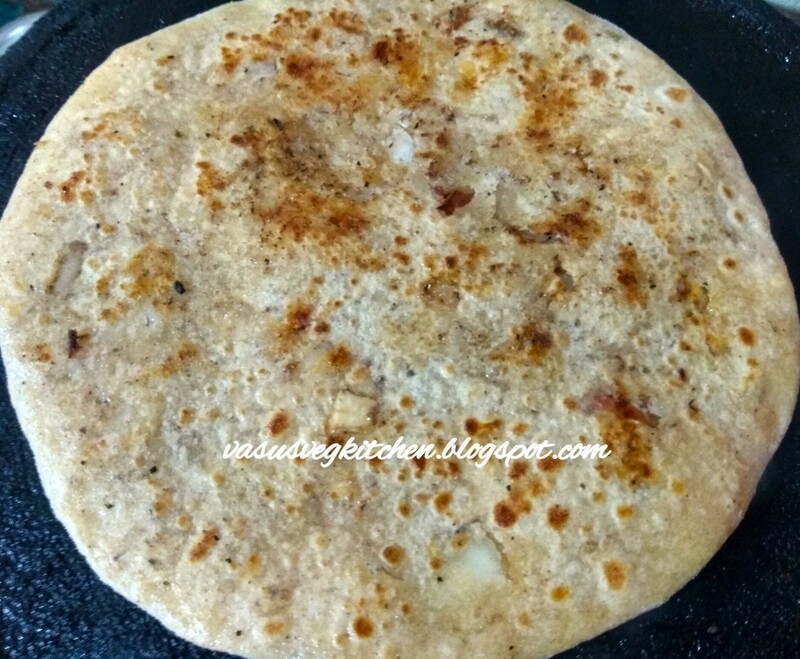 ● Have sweet coconut paratha when it is hot by adding dollop of ghee on it.